First impressions matter. Inside the YWCA, we’ve taken many steps to make sure that our 96-year-old building makes a strong one – that it’s a place for healing, for safety, for empowerment. Outside? It’s a different story. Construction. Weather. Pedestrian traffic. It’s all taken a toll, and we simply haven’t had the resources to make the exterior of our space what it should be. We once had a woman come to our building, scheduled for a counseling appointment. She pulled up in her car and took in her surroundings. Inside was an experienced and caring therapist. A calm, trauma-informed environment. A way forward amid the fear and anxiety she had been dealing with as a result of domestic abuse. But the woman never made it inside. She looked around, nervous and unsure, and saw construction tape. A torn up sidewalk. Dirt and withered plants. She put her car back in drive, and left. This must change. For the survivors of domestic abuse and sexual assault confronting their trauma here, for the young women developing the leadership skills to change the world here, for the family members holding the hand of a loved one seeking help here… they all deserve to come to this building and see something growing, something vibrant. You can make that healing possible. 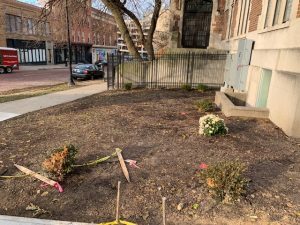 With the Sheldon street construction nearly complete, the time is right to implement plans for the YWCA Healing Garden. 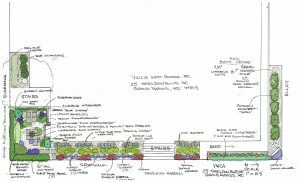 We developed these plans with a team of professionals to reflect the beauty of what happens inside the YWCA. A priority was put on native plants, to align with our organizational value of sustainability and environmental responsibility. It also has water and facility features to make maintenance minimal. Money raised will go toward purchase of plants, mulch, stone, supplies, and labor. Tuesday November 27 is Giving Tuesday, a day dedicated to giving back. 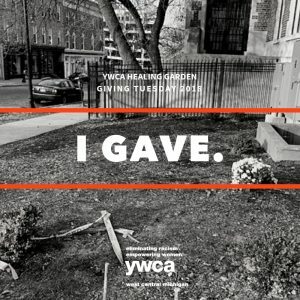 Your gift will make the dream of YWCA Healing Garden a reality. Will you help us? Click here to go to the YWCA Healing Garden donation page on Facebook. Not on Facebook? You can give here. Note: Facebook will be matching gifts made on Giving Tuesday (Tuesday November 27) from 8am EST until the match fund of $7 million runs out. Make your donation early on Giving Tuesday and double the power of your contribution! After you give? Share this graphic on social media and help bring others to the fundraiser. The more who support, the closer we are to making the YWCA Healing Garden a reality!